The EFNMS has installed a new committee to focus to industry4.0 and digitization in maintenance functions. First web meeting was held on 25th of June. Next meeting will be held physically at Antwerp, 23rd September on the occasion of Euromaintenance 4.0 hosted by BEMAS. 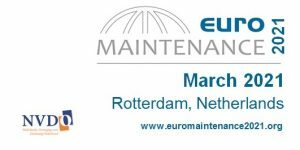 Do not forget to REGISTER for Euromaintenance 4.0 and use this code: ” EM40EFNMSC” to receive your free welcome gift.